I am currently participating in Sarah's art of the note: gocco swap. I had so much fun putting together my notecards for this swap. I had a little helper for printing the cards. I wanted my notecards to be reminiscent of the summer, the vacations that we took this year and the time that we spent together as a family. My husband took some great photos when we were in Santa Cruz a couple of months ago and it all just came together. I have been talking forever about opening an Etsy shop and I am thrilled to announce that I finally did it! I have only a few items in there right now but am adding to it slowly. I already sold one item and that was really exciting, it was a child's drawstring backpack. I am working on some more items that I will add soon. I had a couple extra sets of these note cards from the gocco swap and I have added them to the shop. Go take a look! 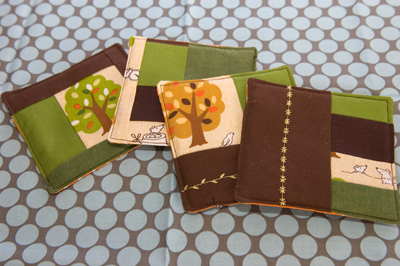 Here are my finished coasters for the swap I am in hosted by Amy of Ibby Bee. My swap partner is overseas and so I am cutting it a little close as they are due on Sunday. I hope she likes them. 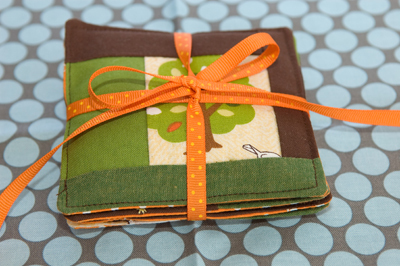 I wanted to show off the fun stuff that I got from Valerie, my partner in the Cupcake Swap. 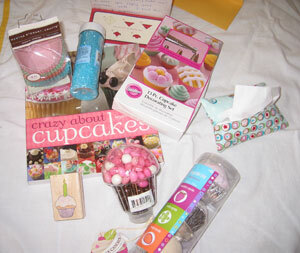 Valerie sent me a big box of cupcake goodies. I love everything! Thank you so much Valerie! This cupcake cookbook has some really cute ideas for decorating, and she included a cupcake decorating set and sprinkles! The Martha Stewart cupcake liners are so cute. And I love the cupcake rubberstamp, I looked for one to send out with my swap package but never found one. I know this is not the best photo but I took it quickly because I wanted to post this before we leave on our trip tomorrow. Here is a shot of some of the goodies I sent to Valerie. 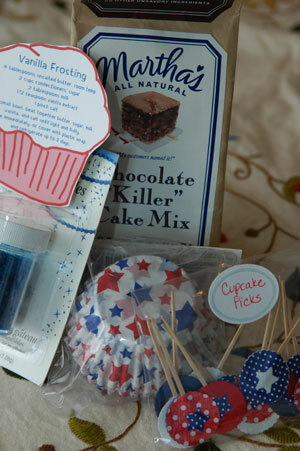 I went with a 4th of July cupcake kit theme and made my own cupcake picks. These came out so cute that I made an extra set for myself. 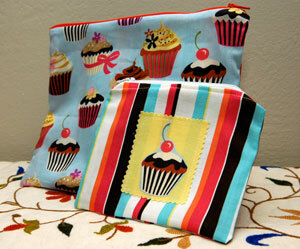 Here are two lined zipper pouches made with some cute cupcake fabric I found on ebay and a striped fabric I had in my stash.